Just like fellow pop diva Kylie Minogue and supermodel Chanel Iman, Mariah Carey is a celebrity often spotted on superyacht vacations. In August 2017 Mariah Carey shared this fun snap from a day on board a luxury yacht with her children. Although it is not known which yacht Carey chose, it is likely the boat was moored in American yachting hotspot Fort Lauderdale where the singer was scheduled to perform that evening. 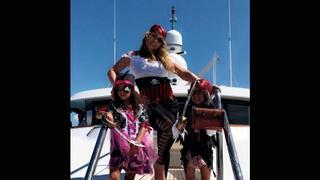 Carey captioned the picture 'Treasure hunt' referring to the trio's pirate fancy dress proving that a family-friendly charter yacht can be a great day out for everyone. In summer 2016 Carey was been spotted on board Arctic P, the 87.57 metre explorer yacht belonging to her ex-fiancé James Packer, with her children Monroe and Moroccan in Italy. The family met the yacht in Naples before cruising to Ponza where this image was taken. The extended Mediterranean cruise then continued to popular yachting destinations Antibes and Cannes where Carey and Packer (pictured) took the opportunity to head ashore and try out some of the top restaurants in the French Riviera, including the Hotel du Cap-Eden-Roc. However, this trip was not Mariah Carey's first vacation on board Arctic P. In summer 2015, Carey and her children once again joined Packer to discover the Italian Riviera on board his superyacht. The trip began in Capri - where this snap was taken - and proved easy terrain for Arctic P which holds the record for going the furthest south a yacht has ever been. While in the Mediterranean, the American family also took the opportunity to visit some celebrity-favourite destinations such as Cannes. Of course, being the true pop sensation that she is, Mariah Carey made good use of her surroundings to don a series of glamorous looks including this show-stopping Alaia dress. Before meeting Packer, however, Carey's favoured cruising ground was Australia. The star was spotted sailing the Great Barrier Reef in 2012 and visited the increasingly popular superyacht destination again in 2014 to mark the end of her Elusive Chanteuse world tour.